The killings of two Western reporters in the city of Homs and reported deaths of some 60 people across Syria have triggered further Western outrage towards the Damascus government. 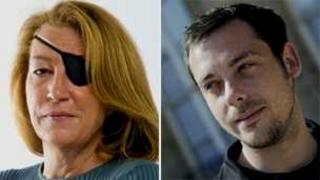 Sunday Times reporter Marie Colvin, an American, and French photographer Remi Ochlik died in shelling by Syria's government forces. The US said it was "another example of the shameless brutality" of the regime. French President Nicolas Sarkozy said: "That's enough... The regime must go." Syrian troops have been shelling opposition-held areas of Homs for weeks. Thousands have died since the unrest erupted last March. The International Red Cross said it hoped Wednesday's deaths would draw the attention of the world to the many hundreds of other people suffering in Syria. It earlier urged the government and rebels to agree to a daily ceasefire, to allow medical supplies to reach the worst affected areas and get civilians out. However, there is no sign yet of this being agreed. Colvin, 56, and Ochlik, 28, were reportedly staying in a house in Homs' area of Baba Amr that was being used by activists as a media centre when it was hit by a shell on Wednesday morning. Marie would not want any tribute to leave out mention of the people she met, the stories she heard. She often spoke of how humbled she was by the "quiet bravery of civilians". We've come to expect that wherever something of consequence was happening, Marie would be there. Her signature was not just to go to a story, but to stay for as long as she could, regardless of the danger or discomfort. I remember a conversation long ago where she told me a partner wanted her to be what she called a "Laura Ashley" - pretty and perfect in the home. But that wasn't Marie and she knew it. She was, without exception, a kind and considerate colleague and fellow traveller, a woman who inspired and engaged. Rockets were also said to have hit the building's garden when people tried to flee afterwards. One was named as British freelance photographer Paul Conroy, who was working with Colvin, and Edith Bouvier of the French newspaper, Le Figaro. Bouvier was said to be in a serious condition. The dead and the injured journalists are said to have been taken to a field clinic in Baba Amr. Activists have expressed fears that Bouvier risks bleeding to death without urgent medical attention and they were trying to get her out. Syrian state TV said the information ministry had asked officials in Homs to determine the location of foreign journalists because it had learned that some may have been injured. In Washington, US State Department spokeswoman Victoria Nuland said: "This tragic incident is another example of the shameless brutality of the Assad regime." Earlier, the US warned that it was not ruling out taking "additional measures" to assist the rebels if the government onslaught continued. In Paris, French Foreign Minister Alain Juppe said his country held the Syrian government accountable for the deaths. "Damascus owes us an answer," Mr Juppe said. UK Prime Minister David Cameron told parliament: "This is a desperately sad reminder of the risks that journalists take to inform the world of what is happening, and the dreadful events in Syria." Later, the Syrian ambassador to London was summoned to be told that the UK expected Damascus to arrange for the immediate repatriation of the journalists' bodies and to provide medical treatment for the injured British journalist. The editor of the Sunday Times, John Witherow, said the newspaper was doing what it could to recover Colvin's body and get Conroy to safety. "Marie was an extraordinary figure in the life of the Sunday Times, driven by a passion to cover wars in the belief that what she did mattered," he added. "She believed profoundly that reporting could curtail the excesses of brutal regimes and make the international community take notice." Her mother told journalists Colvin's legacy was: "Be passionate and be involved in what you believe in. And do it as thoroughly and honestly and fearlessly as you can." Ochlik had reported from Haiti and covered many of the recent uprisings in the Arab world. Media captionSunday Times Editor John Witherow: "She may have been targeted"
Colvin had been a foreign correspondent for the Sunday Times for two decades, and had reported from several war zones. She lost the sight in one eye in Sri Lanka in 2001 after being hit by shrapnel. On Tuesday, she told the BBC the bombardment of Baba Amr by Syrian government artillery and tanks had been "unrelenting". "I watched a little baby die today, absolutely horrific, a two year old - found the shrapnel had gone into the left chest and the doctor said: 'I can't do anything,' and his little tummy just kept heaving until he died. That is happening over and over and over. The Sunday Times on Wednesday made available Colvin's last article in which she said, "We live in fear of a massacre". Western journalists have mostly been barred from Syria since the uprising began. Last month, the French television journalist, Gilles Jacquier, was killed in Homs while visiting the city on a government-organised trip.